GMO means Genetically Modified Organism. Over 60 countries around the world require GMO labeling or ban GMOs outright. But not the U.S. 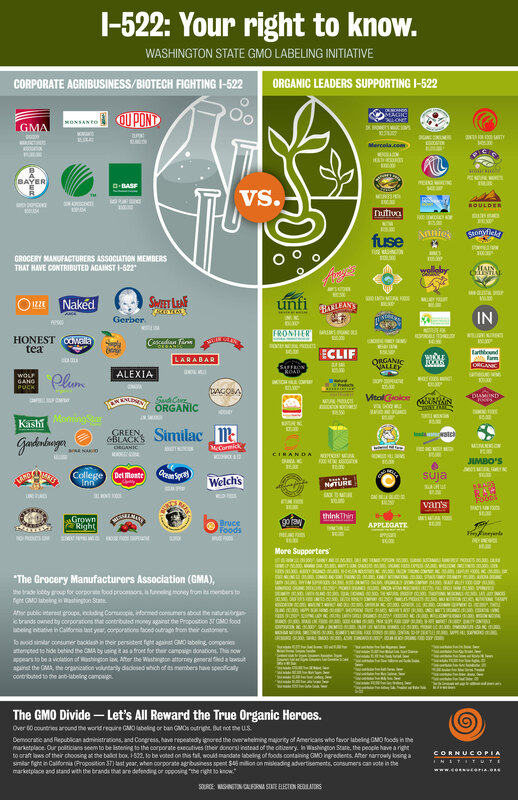 The food companies on the left of the graphic spent tens of millions of dollars in the last two labeling campaigns – in California and Washington State – to prevent you from knowing what’s in your food. You can even the score by switching to the brands on the right; all of whom stood behind the I-522 Right to Know campaign. Voting with your pocketbook, at every meal, matters. You can read more about GMOs on Dr. Mercola’s website. You can access the Shoppers’ Guide to Avoiding Genetically Engineered Food for yourself.